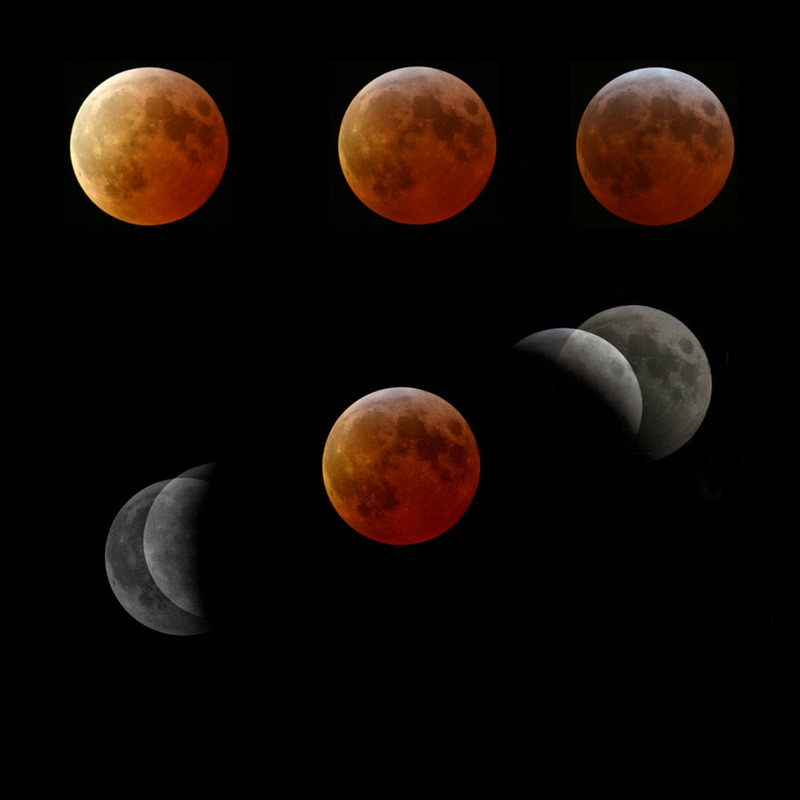 DDAS member Chris Newsome produced this montage of images from the lunar eclipse of the 3rd-4th March 2007. He used an un-modified Canon EOS300D camera through a Skywatcher 102T refractor on a Celestron ASGT mount and a Baader Fringe Killer filter. The exposure details are for totality......single 6 second exposures at 100 ASA. No processing, they are exactly as they came off of the camera. For the partial phase......1/25 and 1/250 second at 100 ASA. The images were overlayed and opacity adjusted to show the shape of the shadow. All the images were montaged onto a black background, the partial phases being placed so as to show the shape and size of the shadow of the Earth in relation to the path the Moon took through it. After the Moon had passed the meridian, Chris had to flip the mount round to carry on tracking, although for some reason it wouldn't follow the Moon so between each shot he took on the night (every five minutes) he had to manually push the scope to get the moon in the FOV (he thinks he had incorrectly moved the scope and it thought that it couldn't go any further!). Chris also created a movie of the eclipse. The first frame was taken at about 22:00 UT and the last at about 00:05, a few minutes after totality ended. The movie shows the passage of the Moon between the stars 59 Leonis (on the left) and 56 Leonis (on the right). The partial phases are 1 second exposures and the totality phases are 6 second exposures. These were taken at 100 ASA with a Canon EOS300D camera through a Skywatcher 102T telescope. None of the images received any processing, they are as they came off the camera. The images were aligned (on both stars) using MaximDL and then compiled into an AVI file. Click on the link below to download and play the 295 KB Windows Media File. If you encounter problems you may have to right-click on the link and choose the 'Save Link As' or 'Save Target As' option to save the file onto your computer first before opening it using the player of your choice.